Michael Elsner has carved out a career as a top session player in television and film in Los Angeles. He specializes in rock and has a slew of rock, acoustic, and metal songs on the site. Michael also has an insightful study into Exotic Scales, a topic that can provide a great way to expand your lead vocabulary.Check it out! 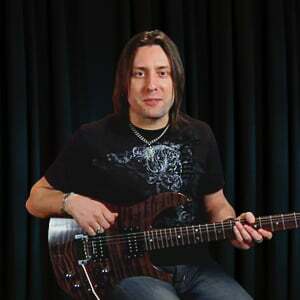 In this series of guitar lessons, Michael Elsner will take you through the parts to the song "Bad Day", as made famous by Fuel. We'll examine the tones and chords used, the main rhythm for the verses and choruses, the pre-chorus, and the outro and solo. You'll learn the solo and lead melodies, then play through it all in a performance. In this tutorial we'll look at the power ballad "Ballad of Jayne", as made famous by L.A. Guns in the late 1980's. Micheal Elsner (a true "L.A. gun" himself) will take you through the tuning and chords and the intro riff/progression that returns throughout the tune. He'll also look at the pre-chorus and chorus, the rhythm part under the solo, the electric guitar arpeggios, and the distorted guitar part. Michael then gives you the cool country-influenced licks and the solo itself, followed by a full performance. In this tutorial, Michael Elsner will guide you through the parts of the song "Drops of Jupiter", as made famous by Train in the early 2000's. You'll learn the chords to the song, the acoustic strumming, the electric guitar parts, and - because this is largely a piano-driven song - how to play the piano parts on guitar. As always, we'll finish of the tutorial with a play through to our custom backing track. Along with a soy latte, of course! In this song tutorial, Michael Elsner will give you the details to the song "Harder to Breathe", as made famous by Maroon 5. Michael will tune you in to the chords and tuning,and the funky single note lines in the verses. He'll then show you the chorus and the chords in the bridge section, followed by the guitar solo. As always, we'll put it all together in a final play through performance with a custom backing track! In this set of 11 lessons, Michael Elsner guides you through the 80's rocker "Head For A Heartbreak" as made famous by Winger. This big hair tune features some straight-forward power chords, blended with some chords not common to hard rock. You'll learn all the twists and turn here to the chords in the verses, choruses, and bridge; you'll learn the rhythmic elements, and you'll also learn the two solos. The soloing here uses whammy bar and tapping techniques, and is a lot of fun to learn and play! In this twelve lesson set, Michael Elsner is going to teach you the melodic alt-rock hit "Hey Jealousy", by the Gin Blossoms. Michael will tune you in to the chords and tones, then pick apart this two guitar tune. We'll look at the verse progression and variations, the intro and outro, and the choruses; then we'll break down the various fills plus look at the guitar solo. To end, we'll play through the whole song in a full performance. In this seven lesson tutorial, Michael Elsner with teach you the song "Hole Hearted", as made famous by Extreme in the 90's. This song is played on acoustic guitar; in the original it's a twelve string but Michael will use a six string for the teaching. He'll take you through the chords and tuning, the intro and verses, the pre-chorus and chorus, then show you the slide guitar part and end it with a full play-through performance. This is a nine lesson song tutorial, where you'll learn "I'll Be" as made famous by Edwin McCain. We'll examine the chords and tones, the acoustic progression, the chorus and bridge, the clean electric parts, the distorted part plus an eBow part. After all that, we'll play the song all the way through. In this series of lessons, Michael Elsner will teach you the alt-rock song "Santa Monica", as made famous by Everclear. Michael lays out the tones and the chords for you, then the intro and verse elements, the chorus and outro, the licks scattered throughout the tune, then plays it in its entirety in a play along performance. Lastly, you'll jam along by yourself with the backing track. In this set of lessons, Michael Elsner will give you the low-down on the 80s hard rocker "Shake Me" as made famous by Cinderella. Michael will take you through the basic tones; the chord progressions in the verses, choruses, bridge, and underneath the solos; what the three guitars are playing in the breakdown; the short lick in the turnaround; then all three solos that occur in the song. As always, you can play along with a full performance with our custom backing track! In this song tutorial, Michael Elsner will teach you the post-grunge song "Why I'm Here", as made famous by Oleander. We'll look at the chords used and the unusual tuning, the main verse riff of the song, and the heavy distorted chorus. The we'll learn the rhythm parts that occur under the solo, the intro and turnaround lead melodies, and the guitar solo itself. We'll top it all off with a full performance play along.